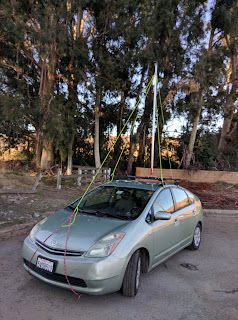 I made a mast to fit on my 2006 Toyota Prius to permit further testing. The mast is an 8 foot section of aluminum tubing; at that height, if there is any turbulence, then it is likely to also occur at takeoff and landing and should probably be digitally filtered. In any case, it's a cheap way to do tests. The mast is made of an 8-foot length of 1" square 1/16" wall aluminum tubing. 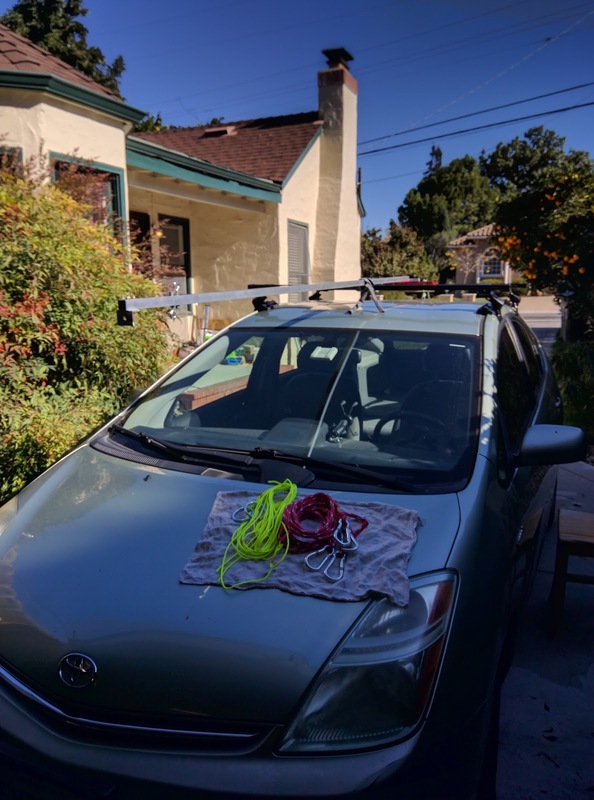 At the bottom, it is riveted to a large T-strap hinge which is attached to a piece of plywood which is in turn held onto the car's roof rack bar with a pair of U-bolts. 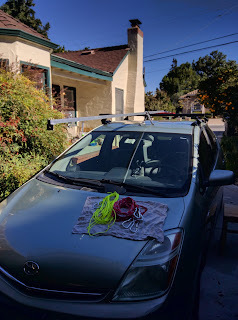 I have some ropes with carbiner hooks attached to the four jacking points under the bumpers, and from these and the roof rack I have 4 stays made of paracord. The lines come off and the mast folds down for transport. I don't deploy it unless I know I'm on a stretch of road where I'll have clearance. 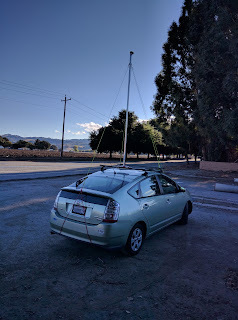 I drove the rig around today on a 45mph road and on the freeway, with a camera attached, to determine how it held up. Stability seemed good. I'm generally not worried about excessive vibrations. 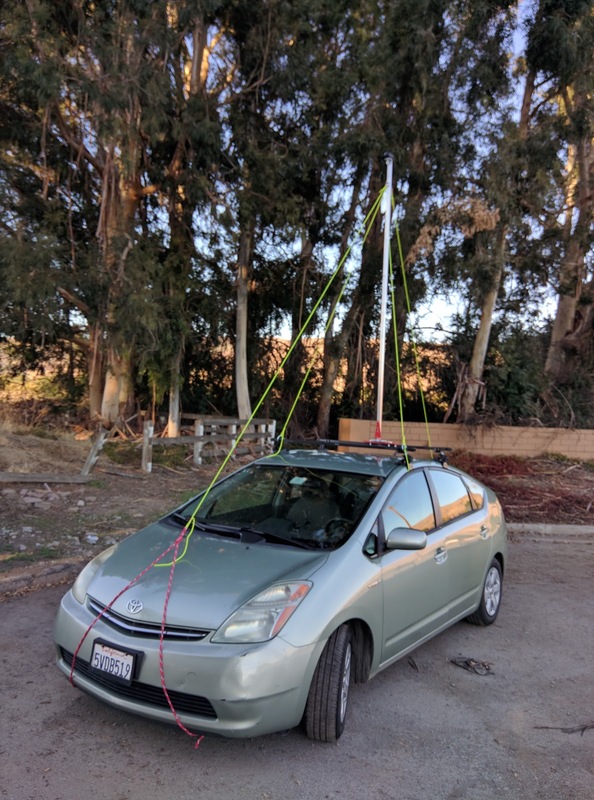 For a subsequent test, I'd like to make a dead-simple wind vane and stick it up in view of the camera to get a baseline for how turbulent the flow is up there and how that is affected by vehicles ahead of me on the freeway.